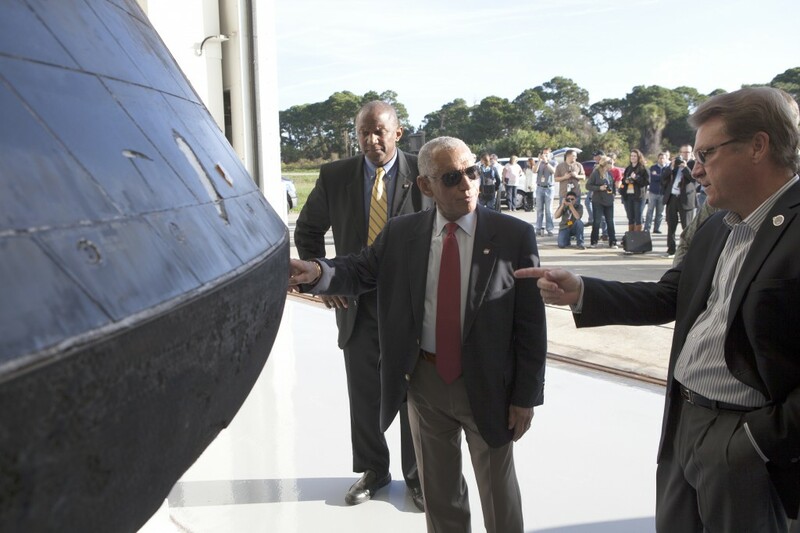 NASA Administrator Charlie Bolden looked over the agency’s Orion spacecraft this morning for the first time since it returned to Kennedy Space Center following the successful Orion flight test on Dec. 5. Bearing the marks of a spacecraft that has returned to Earth through a searing plunge into the atmosphere, Orion is perched on a pedestal inside the Launch Abort System Facility at Kennedy where it is going through post-mission processing. 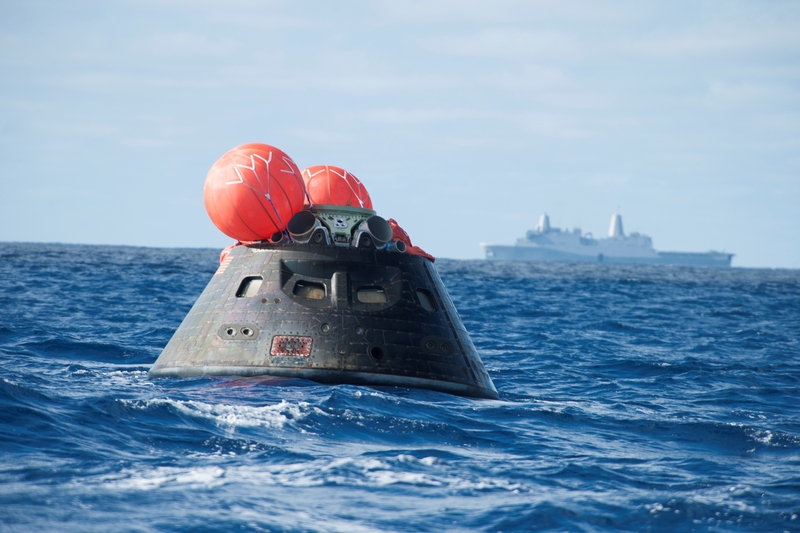 Although the spacecraft Bolden looked over did not fly with a crew aboard during the flight test, Orion is designed to carry astronauts into deep space in the future setting NASA and the nation firmly on the journey to Mars. 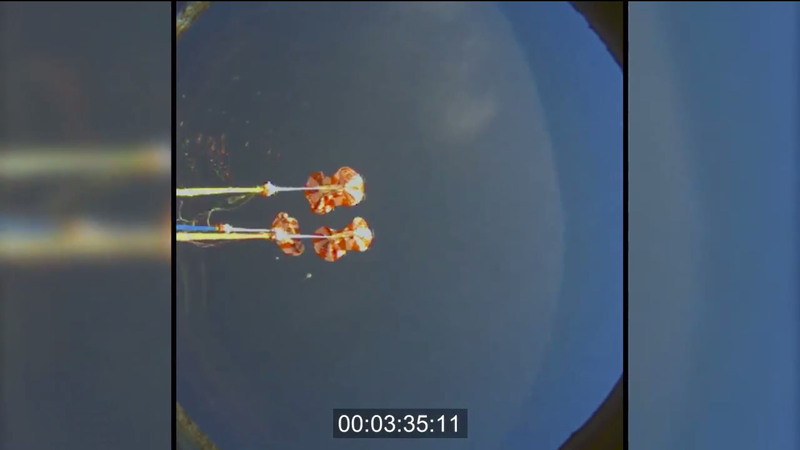 We can’t give you a ride inside Orion firsthand, but we can show what it looked like from the spacecraft thanks to cameras aboard the ship during the 4.5-hour flight test on Dec. 5. 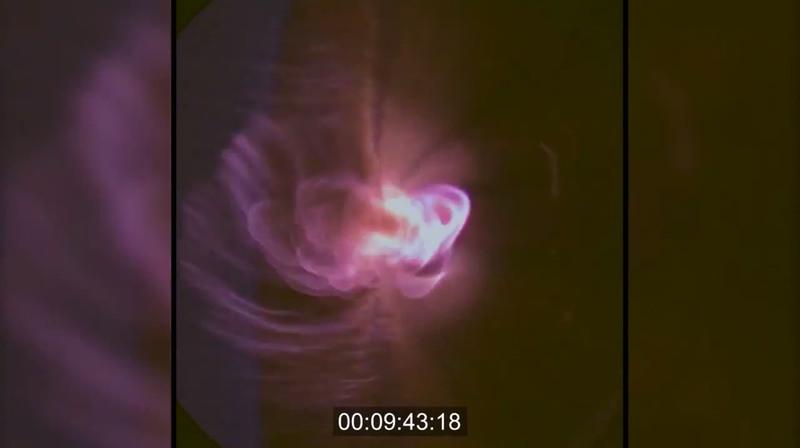 The last 10 minutes of Orion’s flight test show the plunge through Earth’s atmosphere, when searing plasma so hot it appears purple (upper left) surrounds Orion. 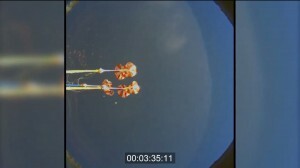 A few minutes later you can witness the jettison of the forward bay cover, followed by the release of the drogue chutes and then the main chutes (lower left). 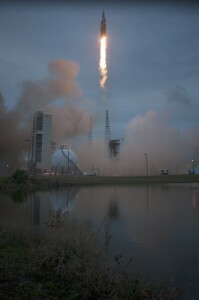 It’s all right there before your eyes just as it happened on Orion and how future astronauts will see it when they return from deep space missions and one day coming home from Mars. Read more details about the video and Orion: http://go.nasa.gov/1AP2RfC. Orion is home! 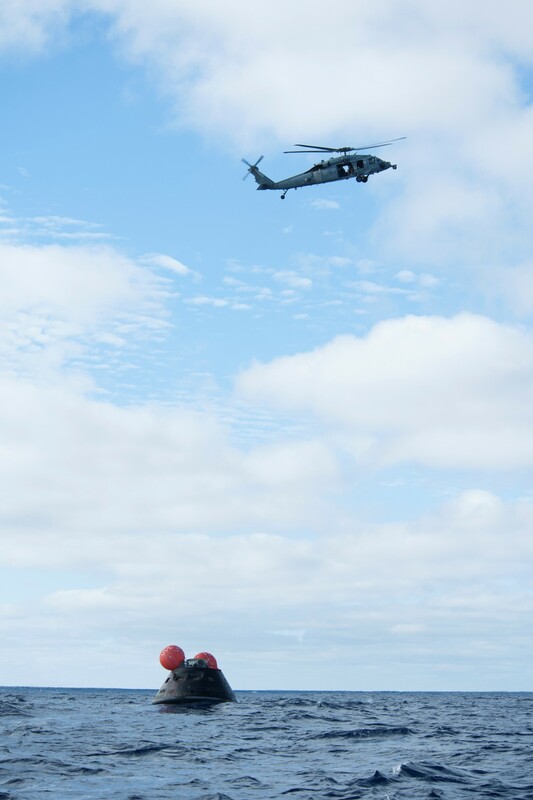 Back at NASA’s Kennedy Space Center following its trip of 3,600 miles up in space, splashdown in the Pacific and a trek across the U.S.
An MH-60 helicopter flies over the Orion as recovery teams move in to retrieve the spacecraft. 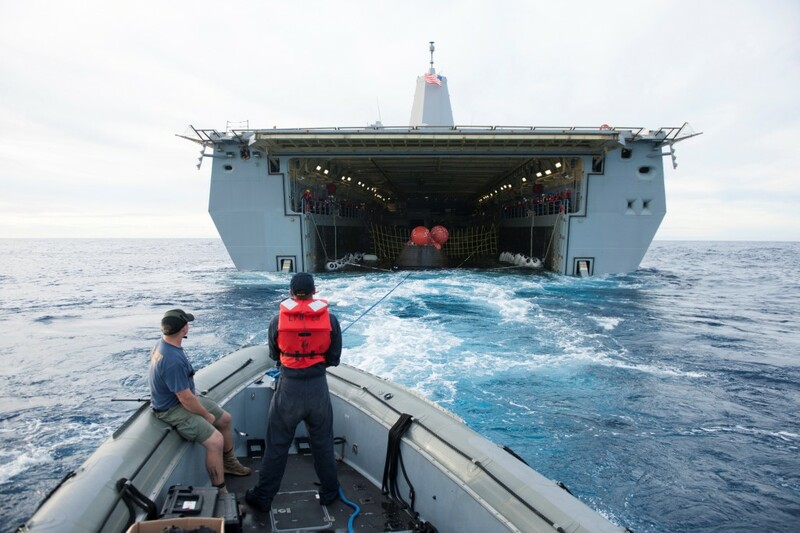 Orion is expected to be off-loaded from the USS Anchorage today at Naval Base San Diego today following its recovery Friday after splashdown in the Pacific Ocean. 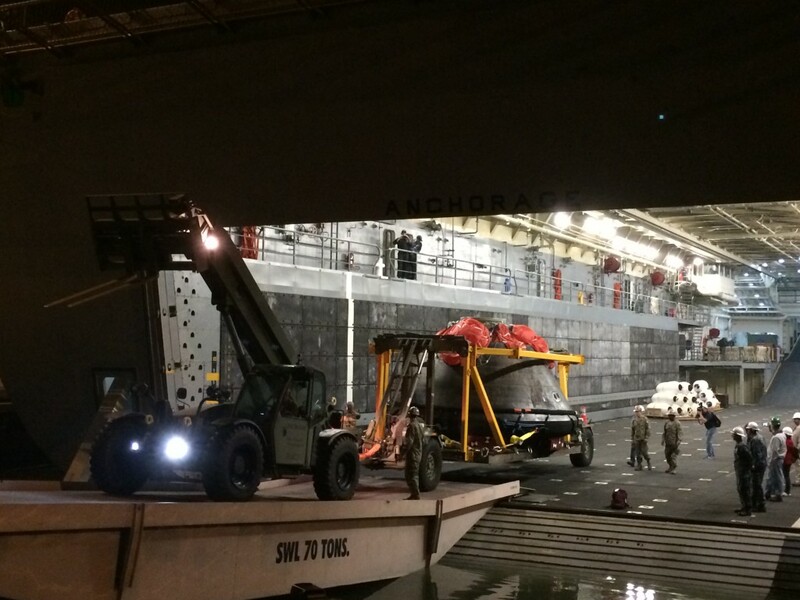 The spacecraft is nestled inside the well deck of the amphibious ship during the trek from its splashdown point about 600 miles southwest of San Diego. 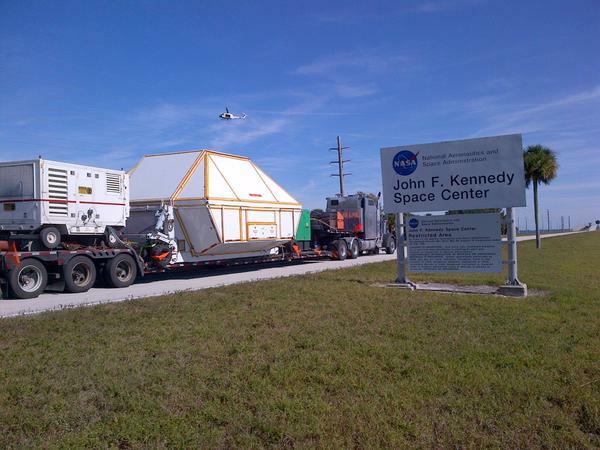 The spacecraft then will be transported to NASA’s Kennedy Space Center in Florida where engineers will gather more information about Orion’s performance. Orion’s flight tested many of the systems most critical to crew safety, including key separation events, parachutes and its heat shield. 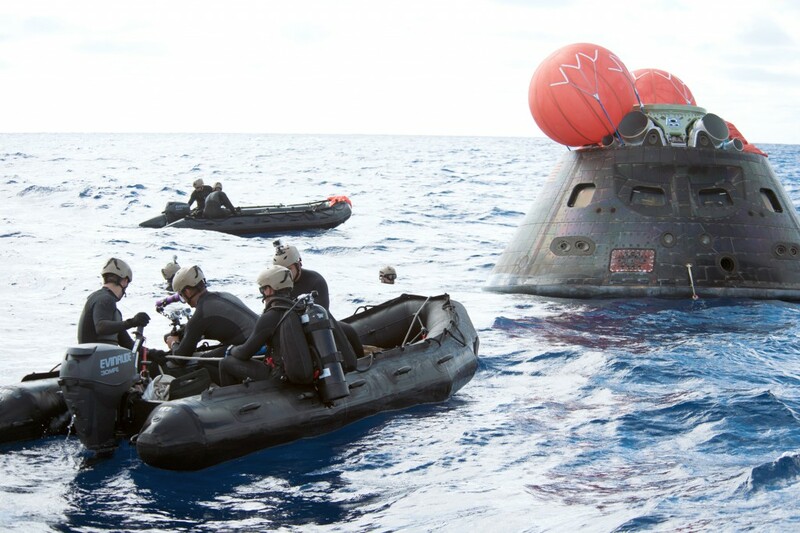 During Orion’s re-entry into Earth’s atmosphere, the spacecraft endured speeds of 20,000 mph and temperatures near 4,000 degrees F.
The Orion floats in the Pacific with stabilizing balloons inflated as the USS Anchorage moves int to retrieve the spacecraft. The Orion spacecraft is guided into the well deck of the USS Anchorage during recovery operations following splashdown. 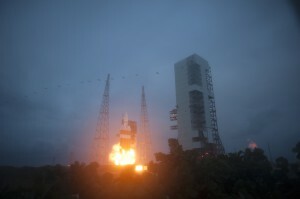 Fresh from the conclusion of the first-ever flight test of NASA’s Orion spacecraft, some of the managers behind the flawless mission gave an early indication of what it took for Orion to be successful and what the spacecraft’s two-orbit, 4.5-hour means for its goals to explore deep space and make a human journey to Mars. Orion launched this morning at 7:05 a.m. EST to begin what would prove to be a perfect flight. Riding atop a United Launch Alliance Delta IV Heavy, the largest rocket in the American inventory, Orion flew to an altitude of 3,604 miles on its second orbit and plunged into Earth’s atmosphere at 20,000 mph before slowing down, releasing its parachutes and landing gently in the Pacific Ocean within sight of NASA and U.S. Navy recovery teams. Orion did not carry any people into space during this flight, but is designed to take astronauts on deep space missions in the future. It became the first spacecraft designed for humans to leave low-Earth orbit since the Apollo 17 mission, the last moon landing by NASA. Orion did not carry any people into space, but is designed to take humans on deep space missions in the future. It became the first human-rated spacecraft to leave low-Earth orbit since the Apollo 17 mission, the last moon landing by NASA. 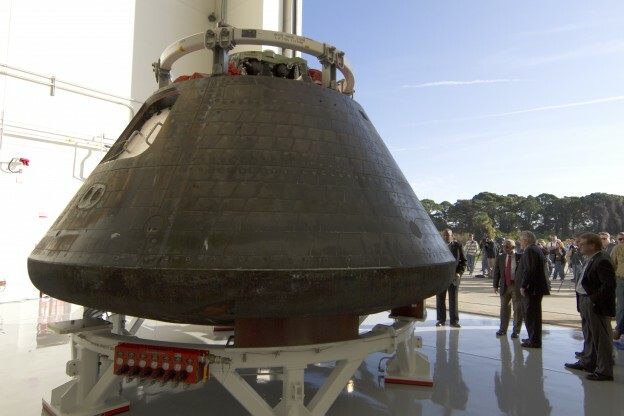 “We’re already working on the next capsule,” said Mike Hawes, Lockheed Martin’s Orion program manager, the company that built Orion and operated the flight for NASA. “We’ll learn a tremendous amount from what we did today.